Yesterday I showed you swatches of 16 different shades of American Apparel polishes on a nail wheel. Today I have “real” swatches of two American Apparel polishes for you. First is Palm Springs, which is a light peachy shade. Interesting but I’m not quite sure if I like it on me. Two coats shown in the picture below. 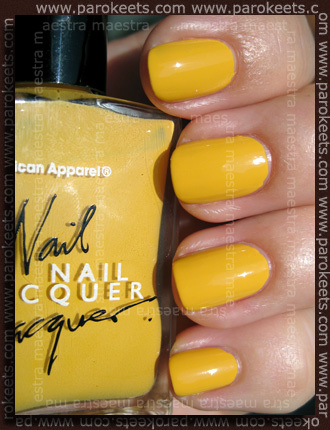 Next (and last) one is a yellow shade called Manila. This polish (because of the name) always reminds me of Thriszha and I mainly bought this shade because of her. Two coats shown in the picture below. I didn’t have any application issues with these. Both were easy to apply. They dried pretty fast too. Palm Springs is a nice shade in the bottle, but I don’t like it as much on my nails. What do you think? .-= elchy´s last post … My first Carlos Santos =-. Te dva mi pa nista všeč. Ne v steklenički še manj pa na nohtih.